Mr Solomon Dalung, Minister of Youth and Sports has applauded the Super Falcons’ 6-0 trouncing of Equatorial Guinea in their last Group B match of the 11th Women Africa Cup of Nations in Accra Ghana. 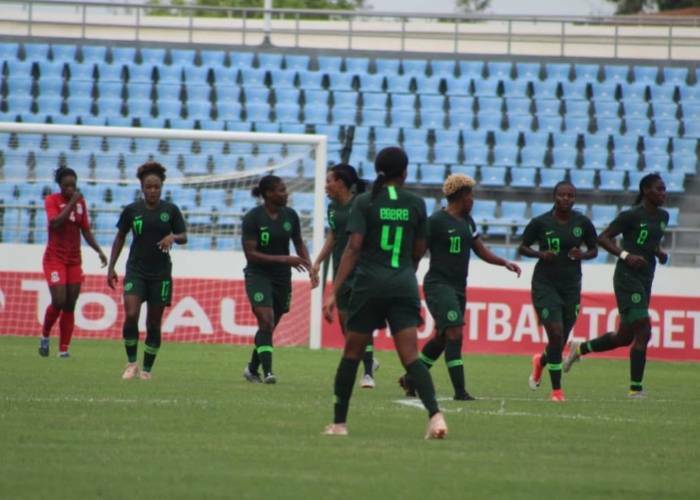 Asisat Oshoala scored a hat-trick while Francisca Ordega, Desire Oparanozie and Rita Chikwelu pulled one goal each to set up a semi – final match-up against Cameroon’s Lionesses. Dalung congratulated the Falcons for their emphatic win and enjoined the players to reinforce their dominance of women’s football on the continent. “I am delighted in your performance so far in the Women Africa Cup of Nations in Ghana. As the power house of women’s soccer in Africa, I have no doubt that you can go all the way to the final to win the tournament. The Minister also assured the team of the fervent love, support and prayers of President Muhammadu Buhari, the Government and the sports -loving people of Nigeria and urged them not to disappoint them. The Super Falcons face the Lionesses of Cameroon on Tuesday November 27, 2018 in Accra. Nigeria are 2nd with 6 points behind South Africa who top the table with 7 points. Zambia have 4 points and Equatorial Guinea have 0 points.